How To Clean Memory Foam Pillows? Memory foam is a popular material for mattresses and pillows because it offers numerous health benefits and alleviates pains and aches in those most sensitive areas of your body. Memory foam pillows proved to be some of the best on the market due to many reasons. They become softer when they come into contact with body heat which allows them to perfectly conform to your head, neck and shoulders, and they recover their shape when they cool down. Besides this, they provide excellent support to your head and neck and keep them in alignment with the rest of your body. They also come in various shapes and can be made from a single piece of foam or stuffed with shredded memory foam. In addition, some memory foam pillows are raised to elevate the neck and provide better support for those with chronic neck and/or shoulder pain and reduce snoring and sleep apnea symptoms. But do you know how to wash them properly and keep them clean? Read our article and find out how to do it correctly and avoid damaging your pillows and reducing their performance. How To Clean Your Memory Foam Pillow? To keep your memory foam pillow clean, you should try to vacuum it every time you change your bedsheets, at least once a week. If you sweat a lot then you should try changing your pillowcase daily or every two days. But, it you don’t have the time to do this every day, you should at least change it once a week. Remove the cover and sprinkle your memory foam pillow with baking soda. Try to cover it well and let it sit for at least an hour and then vacuum it thoroughly by using the upholstery brush attachment. This will remove any dust or pet hair from your pillow and leave it smelling fresh. Spill and sweat stains can be removed with mild detergent used for hand washing wool or silk and a sponge or a soft white cloth or towel. Mix a small amount of detergent in a bowl of lukewarm water. Dip a sponge or a clean white towel or cloth into it until it is wet but not completely soaked and then gently rub the stain from outside toward the center. 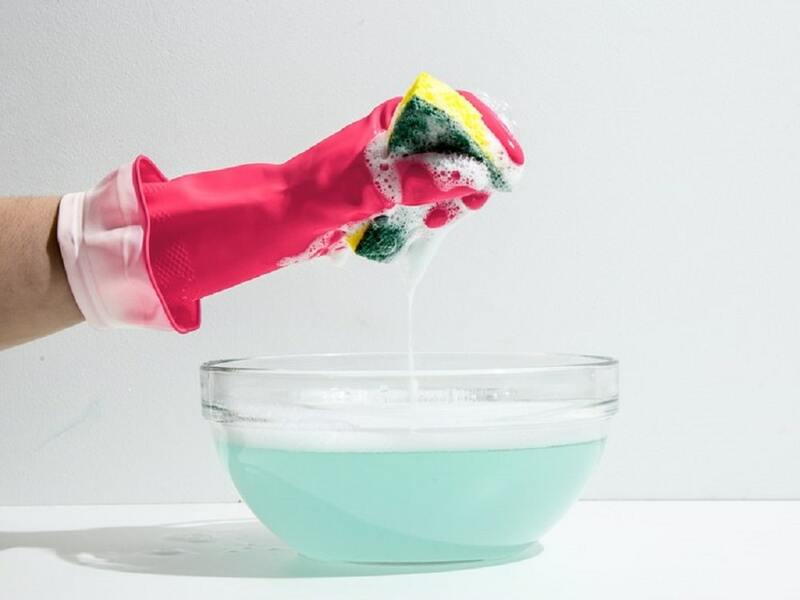 Once you remove the stain completely, dip a clean white cloth or a towel in clean water and repeat the same movements to remove the remaining soap. Do you need to deep clean your memory foam pillow? You must certainly be wondering what the best way to wash it really is. The truth is that you can’t and must not wash your memory foam pillow in the washing machine because this can do a lot more harm than good. Washing it in a washing machine, even on the gentle cycle is simply too rough for memory foam and this can permanently alter and damage the memory foam and render it useless. So, what should you do? The best way to wash your memory foam pillow is by hand. But even if you use this method, you still have to be gentle. Fill a sink or a bathtub with lukewarm water and add a small amount of mild detergent for hand washing if necessary. Slowly submerge the pillow under the soapy water and squeeze it to allow the water to penetrate the beneath the surface. Repeat the process several times. This will get all the impurities and allergens out of the pillow without damaging it. Drain the soapy water and refill the sink or bathtub with clean water this time. Submerge the pillow again and squeeze it until all the remaining soap and dirt comes out of the pillow. Gently squeeze the pillow to remove excess water and leave it to dry. Avoid twisting it or harshly squeezing the foam because you can damage the pillow. Drying your memory foam pillow can be a little tricky. You must never dry it in a dryer because this can melt the foam or cause it to fall apart and damage permanently your pillow. The best option would be leaving it outside to dry naturally on the sun. Hang it on a clothes line with a special pillow hanger or place it on a flat surface with a clean white towel beneath and leave it to dry. Be careful to pick a sunny day to wash your pillow so it can dry quickly and flip it from time to time to make sure both sides dry completely. Otherwise, if it stays wet for too long, mold and mildew can appear and ruin your pillow. If you don’t have where to put it outside, find a well ventilated spot in your home and place your pillow there again on a flat surface with a clean white towel under it. Once it is dry, it will be ready for use again. Read our pillow reviews and find out what are the best memory foam pillows available on today’s market.